A security guard lies on the ground after being beaten during a clash at Freedom Park in Phnom Penh, July 15, 2014. Four top lawmakers from the opposition Cambodia National Rescue Party (CNRP) were detained and at least 30 people injured Tuesday following clashes which erupted when CNRP supporters moved to end the government blockade of Freedom Park, the country’s main protest grounds in the capital Phnom Penh. The clash between the CNRP supporters, numbering around 200, and security guards marked the worst violence in Cambodia since a deadly crackdown on opposition-backed striking garment workers in January, which led to the closure of the site to the public. Dozens of security personnel and protesters fought with clubs, rocks, and flagpoles, leaving at least 17 guards and 14 CNRP supporters injured, and forcing police to step in and disperse the crowd by firing smoke bombs, Licadho senior investigator Am Sam Ath told RFA’s Khmer Service. Police arrested three elected CNRP lawmakers—Mu Sochua, Keo Phirum, and Men Sothavrin—accusing them of inciting the bloody clash. Following their arrest, some 1,000 CNRP supporters gathered in front of the Phnom Penh Municipal Police Headquarters to demand their release, at which point authorities arrested another CNRP lawmaker, Ho Vann, according to Am Sam Ath. Police are believed to be looking for a fifth opposition MP, Riel Khemarin. The four lawmakers in custody have been officially charged with “provocation to commit crimes” and will face a hearing Wednesday in which a judge will determine whether they can be freed on bail ahead of their trial, Am Sam Ath said. If convicted, the four could face up to two years in prison and fines of up to 4,000,000 riel (U.S. $1,000). This was the first time opposition lawmakers have been detained and formally charged since disputed elections in July last year which had led to massive protests mostly last year. Prime Minister Hun Sen’s Cambodian People’s Party (CPP) was declared the victor in the elections despite allegations of fraud, leading to a CNRP boycott of the National Assembly, or parliament. Freedom Park, the only place where protests were allowed in the capital until its closure in January, had become a focal point for protests against Hun Sen’s rule in the wake of the disputed polls. Hun Sen has announced that a protest ban imposed after the deadly January crackdown would be lifted, but the authorities have refused to allow public protests. In a statement, the ministry said that at least 38 security guards had been injured, including three critically. “The Ministry of Interior is saddened by the incident and urges all people to refrain from violence to protect security and order,” the statement said. Phnom Penh’s City Hall, in a separate statement, condemned the violence as an “illegal gathering” by people seeking to “disturb the social order and the harmony of the people,” and urged authorities to bring those suspected of provoking the incident to justice. The CNRP said that the party would continue to use nonviolent methods to demand the reopening of Freedom Park. “We adhere to nonviolent principles to support any movement in demand of freedom and the freedom of expression,” a party statement said. CNRP officials told RFA that the four opposition lawmakers had been questioned by police and that no one had been permitted to meet with them so far during their detention. Licadho’s Am Sam Ath said he feared that the government and the CPP might use the arrest of the lawmakers as leverage in talks to resolve the country’s political stalemate following the elections. “The four are not responsible for any crime,” he said. Cambodia Red Cross is violating its rule by given out money, 5,000,000 Reil to each security thug got injured in the clash. None was given to protest victims. Read below! Well, freedom is not free. Nobody helps us,but khmer. Hun Sen = communist and under younn communist from Hanoi. He kills khmer without pity. We must defend ourselves. All khmer must stand for our right. Do not let them beat us like an animal! When people are not afraid to die that is when hun hen's control of the country will be over. cpp will not handover the power even they truly lost the next election. 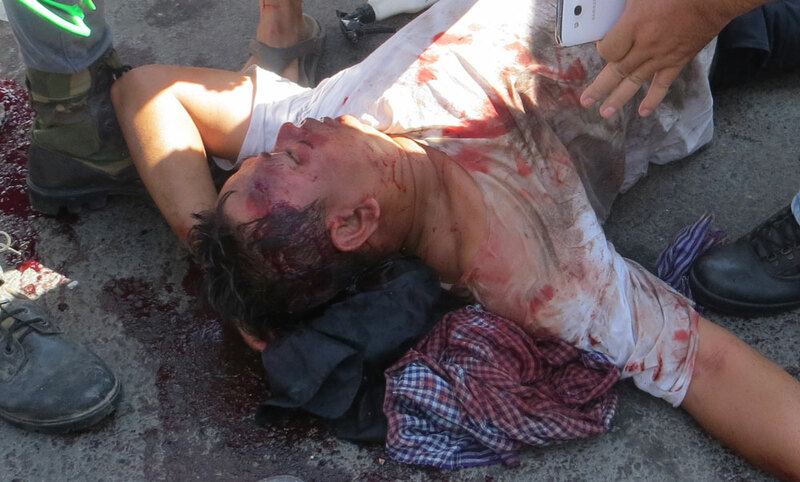 The bloodied revolution will happen in Cambodia in the near future. Who the idiot created this Freedom Park? For what? Who the idiot put barbed wire around Freedom Park? For what? 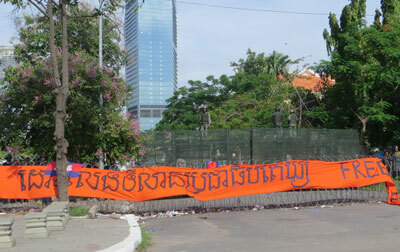 This is all Hun Sen's fault for closing Freedom Park. I saw the video. These people were trying to hang their banner peacefully, but the security forces trying to take it from them. This is when the scuffle began. These people were just exercising their Constitutional rights and they were beaten. This is what is wrong with this country. Here is the hypocrisy. The authority is trying to lay charge against CNRP MPs, yet, Hun Sen was the one ordering his thugs to cause trouble. So if anyone should get arrest over this, it should be Hun Sen.